We’ve narrowed down the best treadmill desks on the market to help you stay moving during the work day. Check out our top picks in the table matrix below or keep reading for a complete buying guide including key features, popular brands, price ranges, and in-depth reviews. Let’s move! Our top pick for a major reason: simplicity. It fits under any standing desk and comes fully assembled, making set up easy. A treadmill desk that offers more than other budget-friendly options. Comes with high-quality components and a complete treadmill/desk bundle. The model that fits a lot of quality into a compact, lightweight design. Great durability and stellar performance capabilities make this a high-quality choice. The choice to consider when you have a regular treadmill and need a spot for a computer. The standalone desk attaches to almost any normal treadmill. A great combo pack if you’re buying from scratch. Comes with the manual, adjustable standing desk and treadmill base. Compact but plenty of room to work. Lightweight but durable design. High-quality, ultra-quiet motor that’s perfect for offices. Walking speed adjusts in increments, from 0.5 to 2.0 MPH. Higher end features like an on-board computer to track stats. Desk is adjustable to five heights. Ergonomic and comfortable to use with a 220-pound weight capacity. High capacity 2.25 HP motor, with adjustable belt speed from 0.4 to 4.0 MPH. Padded belt and impact-absorbing shocks. Highest weight limit in its class at 350-pounds. An ergonomic surface that can hold 55 pounds of equipment. Has a large workspace and plenty of organizational cubbies. Great warranty. Powerful but quiet 2.25 HP motor. Compact walking surface. Built-in transport wheels to make moving it easy. Bluetooth enabled. Padding on the belt and tread deck is limited. The cheaper price sacrifices the frame’s stability and durability. Settings require a lot of button pushing to control. Can be unstable at the highest adjustment levels. Requires more maintenance than other models. Why Buy a Treadmill Desk? Sometimes called a “walking desk,” “treadmill workstation,” or “standing desk treadmill,” these machines are all about walking. A treadmill desk combines a work surface and treadmill base for burning calories at work. Quick setup. Unlike some other fitness machines, treadmill desks are quick and easy to set up. Most models can be set up in 30 minutes or less, which means you can take delivery and start using it in the same afternoon. Less time in the gym. We all know that traffic and long working hours can keep us from getting to the gym. But once you find the right office treadmill, you can stop relying on the gym to get your sweat on. Better creativity and productivity. Studies show that physical activity is linked to creativity. Movement gets the creative juices flowing, benefiting your mood, productivity, and overall attitude towards the day. Lower blood pressure. Studies show that high blood pressure sufferers can lower their levels up to 22 hours following a single walking session! Incorporating walking into your day-to-day will keep your stress low and blood pressure in check. Improvements in mood and health. You don’t have to run a marathon to reap the benefits of movement. Whether you need a brisk walk or a slow stroll, walking at your desk can benefit you both mentally and physically. Between treadmill desks and regular options, you should know the important differences beyond the desk. In terms of exercise, regular treadmills offer more challenging workouts with higher speeds and greater inclines. A treadmill desk is perfect for casual walking while working, maxing out at 4 MPH. They also lack an incline feature to keep you safe. If you need more organization, treadmill desks do offer space for books, laptops, and other accessories. Strip away the handlebar, sidebars, and console and you’ll get an electric treadmill to stick under a desk. Using a rotating belt and an electric motor, this type offers the most control and convenience. 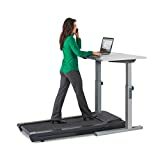 An electric desktop treadmill can also raise or lower the desk height automatically. Things like size, horsepower, noise levels, and storage options all affect the price, normally ranging from $800 to $3000. Take away the motor and move the belt yourself. While this might seem intimidating, there are several reasons to consider a manual treadmill. They’re more affordable, quieter, and can fit anywhere in the office. Plus, self-propelled resistance is more challenging and rewarding. Under $500: Anything in this range is a bare-bones budget model. 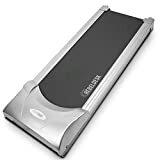 You’ll get a decent quality treadmill that has the basic features you need to glean the benefits of daily walking. But you won’t get the durability or ultra-quiet operation of higher-end options. Under $1000: Going up in price, the quality is good for daily home or office use. Some treadmills will have more features than others. Generally, you should get an onboard computer and a quiet-but-powerful motor. $1000 and up: The real all-stars with many bells and whistles you’d normally see on regular treadmills. Comes with the same solid construction and powerful motor you’ll find on mid-range models. Bluetooth connectivity is common here. A highly respected and trusted brand founded in 1975, now headquartered in Cleveland, OH. NordicTrack offers a range of popular treadmill options, including their bestselling platinum treadmill desk. Founded in 2002 in Salt Lake City, UT. LifeSpan makes a number of popular treadmill desks, including the TR800 and the TR1200. The TR1200 has exceptional ratings due to its durability and technology features. TrekDesk is a bit newer, coming to market in 2008 in Phoenix, AZ. Their most popular product is the TrekDesk Treadmill that offers many features and a handy folding option for easy storage. Rebel Desk started in 2013 in Washington D.C. Many of their treadmills sport innovative features like the slim design and quiet operation of their Treadmill 1000. Make sure the tread belt has plenty of room to fit your stride length. At a minimum, for walking, the tread length should be 50 inches. For running, go longer with at least 55 inches. If you’re over 6’ tall, you’ll need even more tread belt with a minimum of 60 inches. The best treadmill desks allow you to make fine adjustments for the proper fit. Check out the different adjustments available on each model. You’ll want one that can increase the speed for more vigorous activity. Some are also height adjustable, so you can find the best ergonomic position for comfortable office work. Want to adjust settings and track your progress? Then you’ll need a treadmill desk with a detachable LCD panel. Many displays are large enough to easily read and control while walking to make quick adjustments on the fly. Safety should be one of the most important things to consider when purchasing any kind of exercise equipment. The treadmill’s frame should be strong enough to hold your weight. When looking for a treadmill desk, look for safety options such as side rails, a slow top speed, auto pause, and a safety key or pin. These features will keep you and others safe while enjoying the treadmill. Standalone vs. Included Desk: Some treadmills come with an included desk while others don’t. Keep this in mind since a separate standing desk means spending more money. However, the separate purchase makes it easier to find a desk with the surface and storage options you want. Space: A treadmill with a separate table top will require enough space for the base and the desk. The treadmill base can take up around 6 x 4 feet of space. You should also have a buffer zone of 2 to 3 feet on the sides and 3 to 4 feet in back for safety. Power: To avoid electrical issues, a motorized treadmill needs a grounded circuit. Avoid ground fault circuit interrupter (GFCI) outlets, as they can trip often and cause you extra headaches. 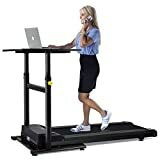 Noise-to-Power Balance: Ideally, your treadmill desk will have a motor powerful enough for walking or light jogging without additional noise to add to the office. Unfortunately, some options sacrifice silent operation for higher speeds. To keep it quiet, keep the motor’s power low. Workspace: The point of a treadmill desk is to work and stay active. For productivity, make sure the desk is large enough to fit a laptop with room for accessories and papers. Maintenance: How much do you want to maintain the treadmill? Some require occasional maintenance and part replacements, while others are very low maintenance. Low-end treadmills require periodic lubrication to keep the rollers moving smoothly. Nearly all will need a belt replacement after a lot of use. The Rebel Treadmill 1000 is our top pick because of its simple setup, straightforward operation, and a great price tag. 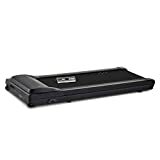 It fits under any standing desk, has a 250-pound user weight limit, and arrives fully assembled for easy set up and use. The lightweight, durable design, backed by the RebelDesk worry-free warranty, means you can walk as much as you want. The motor is high quality and ultra quiet, perfect for even the quietest office. The walking speed adjusts from 0.5 to 2.0 MPH, so you can work out without sweating too much. Keep the sweat away with the built-in wheels when moving the treadmill around. The main drawback is the limited padding on the tread deck. Expect some aches and pains when starting out until your feet adjust to the harder surface. The GoPlus combo stretches your dollar since you get both the treadmill and the desk. The high-quality, stainless steel frame creates a sturdy machine with a 220-pound weight capacity. The long-running belt (63 inches) is also ideal if you’re tall. An LED display screen sets the speed between 0.4 and 4 MPH and tracks time, speed, calories, and distance. The included desk is adjustable to five different heights (from 39” to 46”) for a good ergonomic fit. The set comes in two boxes: one for the treadmill and one for the desk. The only real drawbacks here are the stability and durability of the machine. The cheaper price sacrifices both with a lighter frame. Special features like Bluetooth connectivity are also lacking. The LifeSpan TR1200 doesn’t sacrifice high-end features for its compact design, which comes fully assembled out of the box. A padded belt with compression shocks and an onboard computer are just the tip of the luxury iceberg with this model. The frame is lightweight and durable, making the machine easy to move around in addition to the built-in transport wheels. With a quiet, high-capacity 2.25 HP electric motor, the belt speed ranges between 0.4 and 4.0 MPH. The 350-pound weight limit is the highest in its class. Compared to other models, this treadmill can be harder to control since the detachable computer has more complex settings and menus. Things like speed require more buttons to push, unlike other onboard computers with one-touch settings. If you’d like to keep costs low and have a regular treadmill, buy the TrekDesk Treadmill Desk. 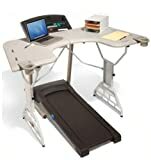 This desk attaches to almost any treadmill, has a large workspace of 72 x 34 inches, and comes with a two-year warranty. The desk adds more than just a flat workspace to your exercise area. It includes a manuscript holder, three-level file folder, telephone/headset stand, and two cup holders to keep everything organized. With a height range between 5’ 4” to 6’ 4”, the desk also manually adjusts to fit your ergonomic needs. Since the desk can be top heavy, some treadmills can be a little unstable at its top height. The ergonomics tend to be problematic for some treadmills, and the plastic design might clash with your office or home furnishings. You’re getting both a manual adjustable standing desk and treadmill base in this combo pack. It’s a compact frame that fits into small office spaces with plenty of room to work. Built-in transport wheels also make it easy to find the perfect spot in a room. The walking surface is narrow at 20 x 50 inches. A high-capacity, quiet 2.25 HP electric motor keeps the belt moving anywhere between 0.4 and 4.0 MPH. A built-in console tracks distance, calories burned, walk and run time, and step count. Plus, the Bluetooth compatibility allows you to sync your activity data to a smart device using the Active Trac app. Compared to other models, this one requires more maintenance. It’s also a tad noisier, which may not work in a quiet space. Keep the speed at 4 MPH or lower while working. Speeds higher than 4 MPH can create an unsteady work environment. If your treadmill desk has an incline feature, keep the treadmill level while working for the best ergonomics. Try to use your treadmill for 1 to 3 hours a day. Steady build up and use will provide the best results. Place the treadmill base on a hardwood floor or low-pile carpet for the best stability. You can purchase a treadmill desk mat to protect hardwood floors from scratches. Position the desk above the treadmill so you’re standing near the middle of the tread belt. The height of the desk should keep your arms bent at 90 degrees and your eyes level with the monitor. Use large screen monitors to use a computer while walking. You can also increase the screen’s font size for ease of use. Q: What speed increments are available? A: Most treadmill desks will go up in increments of 0.1, 0.2, or 0.5 MPH with a top speed of 4 MPH. Start out at 0.5 MPH and gradually increase the speed as you acclimate to walking while at work. Q: What equipment will I need to assemble the treadmill and desk? A: Most office treadmills are a breeze to set up since the majority of tools needed come in the box. You might need some help to get the heavy treadmill frame out of the box. Most desks come as DIY kits, so make sure you have space, time, and patience to assemble one. Q: How noisy is the treadmill at work? A: The noise from a walking treadmill is barely noticeable over the normal background noise of an office. The loudest part of using the machine is the footfall. To reduce the foot noise, try using rubber-soled sneakers. These dampen the sound and add extra traction for safety. Q: How difficult is it to use a manual treadmill? A: On a manual treadmill, the belt only moves if you move it. The added resistance requires more effort than motorized treadmills, but you’ll reap the rewards in the long run. A higher heart rate at lower speeds is just one benefit to throwing out the motor. Treadmill desks make work less stressful and more engaging by keeping your blood flowing while you work. For the best treadmill desk overall, check out the Rebel 1000 Under Desk Treadmill. If you’re looking for the best value pick, we recommend the GoPlus Treadmill Desk. Now it’s your turn. Which model have you tried in the past? Any advice for first-time buyers? Let us know in the comments below!